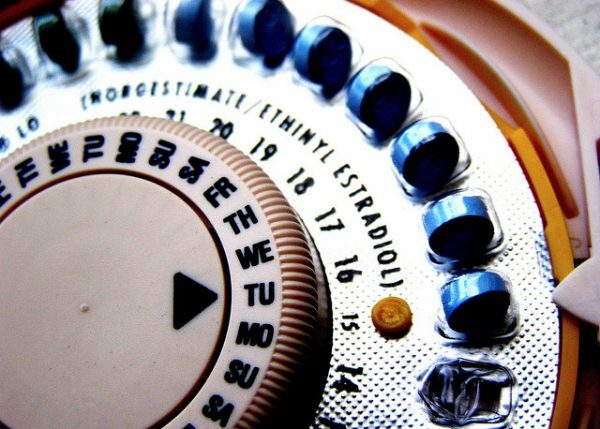 Hormonal birth control may put women at a greater risk for depression, according to recent research published recently in the Journal of the American Medical Association (JAMA). Researchers from the University of Illinois at Chicago examined the risk of depression as an adverse side effect for various medicines. The study sought to answer the question, “How frequently do US adults use prescription medications with depression as a potential adverse effect and is use of these medications associated with concurrent depression?” The answers were troubling. The study observed 26,192 adults 2005 to 2014. Researchers discovered “the estimated overall prevalence of US adults using medications with depression as a potential adverse effect was 37.2%.” They concluded that “[u]se of prescription medications that have depression as a potential adverse effect was common and associated with greater likelihood of concurrent depression.” Researchers observed more than 200 commonly used prescription drugs. In addition to hormonal birth control, depression or suicide are listed as potential side effects on varying blood pressure and heart medications, painkillers, and even antacids. 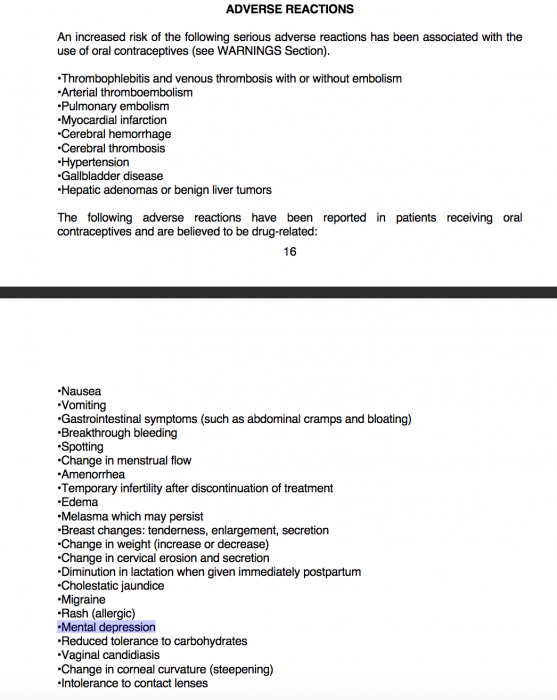 And about a third of Americans are taking these risky medications, the study notes. “Many may be surprised to learn that their medications, despite having nothing to do with mood or anxiety or any other condition normally associated with depression, can increase their risk of experiencing depressive symptoms, and may lead to a depression diagnosis,” said lead author Dima Qato, assistant professor of pharmacy systems, outcomes and policy at the University of Illinois at Chicago. The report was released one week after US health authorities said suicides have risen 30 percent in the past two decades, with about half of suicides among people who were not known to suffer from mental illness. For other common medications — like blood pressure lowering pills, antacids known as proton pump inhibitors, painkillers and hormonal contraceptives — the warnings are harder to find or simply don’t exist in the packaging. “Product labeling for over-the-counter medications does not include comprehensive information on adverse effects including depression,” said the report. Researchers found that more than 200 commonly used prescription drugs have depression or suicidal symptoms listed as potential side effects. Use of prescription drugs with suicidal thoughts listed as a potential adverse effect increased from 17 percent in 2005 to 24 percent a decade later, the study said. Use of hormonal contraception, especially among adolescents, was associated with subsequent use of antidepressants and a first diagnosis of depression, suggesting depression as a potential adverse effect of hormonal contraceptive use. This study is the latest addition to growing body of literature suggesting women’s contraceptive use may have an association with mood disorders. One small 2012 study connected oral combination contraceptives with changes in emotional brain reactivity among women who had previously experienced adverse side effects to the drug. Another article, published in 2003, found changes in estrogen levels could cause bouts of depression among at-risk women. And two separate studies found adverse mood swings among women taking progesterone as part of hormone therapy. It’s clear that a body of literature clearly suggests that, at best, there is a reasonable chance that using hormonal contraception could lead to depression. 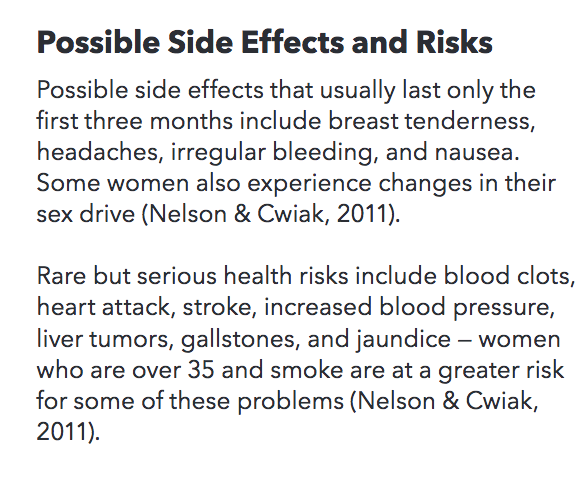 Certainly it isn’t a guaranteed side effect, but for some women, the risks don’t outweigh the benefits, especially when repeated studies continue to report similar results.